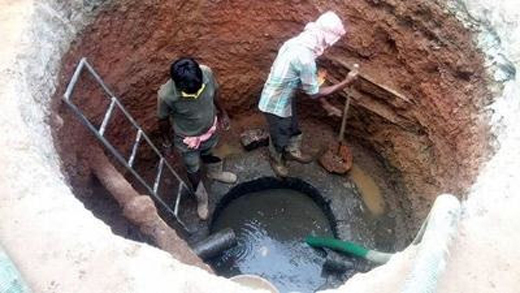 Mangaluru, Oct 21, 2017: In yet another incident that could be a blot on Mangaluru city’s image, two persons were put to work inside a damaged underground drainage chamber near Hampankatta in Mangaluru on October 20, Friday. Though it’s not clear if the incident amounts to manual scavenging, the workers constructed walls of the chamber even as night soil was flowing in. Experts said inflow pipes to the damaged UGD chamber should have been diverted before workers entered it. Youth leader Sunil Kumar Bajal noticed the incident near Don Bosco Hall in Court Ward of Mangaluru City Corporation. Sunil told media the road was dug up at the spot a fortnight ago to facilitate the repair of the UGD chamber. "It’s inhuman to make workers enter the UGD chamber when night soil is flowing in. People should wake up against such inhuman acts and raise their voiceagainst it," Sunil said. When contacted, Mangaluru City South MLA J R Lobo seems to have said, that they should block the inflow and make the chamber dry before starting any such work. They’re not supposed to take up work when inflow pipes are live. It’s wrong and I don’t know why they did it. Everywhere it is banned. He said he would talk to the authorities concerned.